I’ve done a handful of TV debates on Social Security, including the time I said that I wished Republicans had a secret plan for personal retirement accounts. So I thought I was well prepared for this duel with a defender of the status quo on Fox Business Network. I generally think the debate went well, but I confess that I didn’t have the updated numbers on the program’s long-run deficit. I knew the long-run fiscal gap in past Trustees’ Reports was around $30 trillion, but I wanted to make sure I didn’t exaggerate. And since perhaps the economy’s modest improvement has impacted the long-run outlook, I decided to throw out a number that surely would be on the low side. So I said $20 trillion. Well, nobody can accuse me of exaggeration. Here’s a chart showing the program’s dismal long-run deficit, which is compiled from Table VI.F9 and Table V.B1 of the recently released Trustees Report. If you add up the annual deficits, you get $36 trillion. And that’s in today’s dollars! So I made a $16 trillion mistake. That’s a big number even by Washington standards. But it doesn’t really matter since everything I said about policy was correct, regardless of whether the long-run deficit was $5 trillion, $50 trillion, or somewhere in between. If you want to know more about right way to do Social Security reform, click here to see my video on personal retirement accounts. And if you want to learn more about the wrong way to deal with the program’s huge long-run fiscal gap, click here to get the sobering details on the big tax increase that both President Obama and my debating opponent would like to impose. P.S. One encouraging footnote is that personal retirement accounts continue to garner good support in public opinion polls. And with the very good results we’re seeing from nations such as Australia and Chile, I’m cautiously optimistic that reform can happen in America. Here is the most important argument – where is our choice? Why aren’t we free to choose? It’s bad enough we’re forced to invest in a retirement account but to only have the SS program as our option makes it downright wrong. 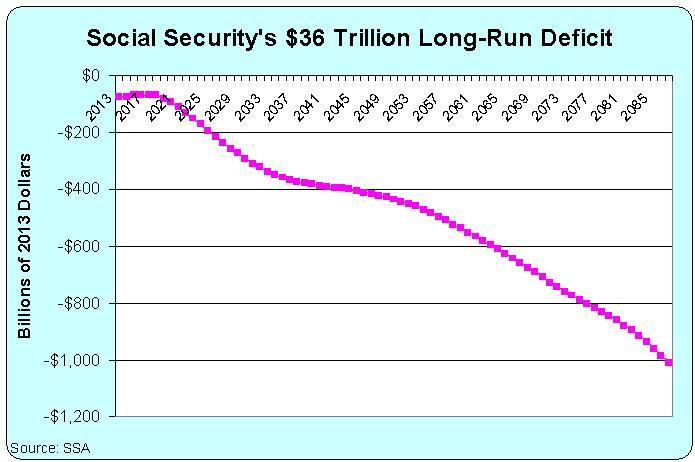 If some people think allowing the government to invest their money is great, they are free to keep their money in the old SS program. Otherwise, everybody should be free to choose their investment options. If we’re going to lose our freedom on whether to invest or not, at least we should retain our freedom to choose how OUR money is invested! Maybe is too late to consider the retirement system that the country of Chile uses. An account in a financial institution is opened in the name of the future retiree. The government cannot touch the account, at the age of retirement the retiree choses how much he/she wants to receive monthly. If there is funds in the account when death occurs those funds go to the heirs. 20 trillion… 40 trillion… what’s the difference? We’re all going to be slaves.